Social media usage varies from platform to platform, so understanding where your audience sits is the most crucial element to setting out the social media aspect of your integrated digital marketing strategy. You can blind post links back to your blog or post cute meme pictures all you like on Facebook, but if your audience predominantly uses Twitter or Reddit, then who are you really working for? Using social media sites as a pastime or to search for goods and services is the cultural norm in a lot of places across the globe, platforms differing by demographic or interests. As a brand, if the audience is so large, it can be difficult to understand what tactic to employ when trying to get to the front of the right audience. 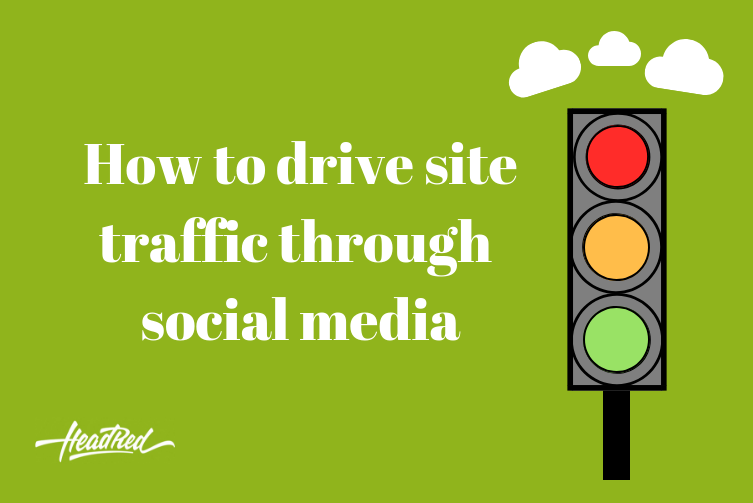 It’s no joke that social media can drive tons of traffic to your site. But, how? The introduction of platform after platform only leads some brands to setting up an account just for the sake of it, to be current. Whilst this can be a good idea if your brand has a portion of the market that each of the social networks seek to serve, it can often give users too much choice, and can mean that your content suffers as a result. Think less is more. It’s a bit like owning every single pair of trainers ever released from every brand in your wardrobe, but you can only ever wear one pair at a time. You don’t need everything all at once. I probably need to work on my metaphor, but you get what I mean. Before you start crafting your posts, you need to know what you want to achieve. Do you want more traffic to a certain landing page on your site, do you want the conversion rate to increase? One of the keys to using social media as a medium to drive traffic to your site is to understand what your brand wants to achieve. Setting goals/targets is one of the ways to record whether you’ve achieved your objectives, and how long it takes. It can also help in the triumph against competitors on social media. Start by understanding what you want to achieve, and by when. For example, x referrals from x social channels, generating x on-site conversions. It’s well-known in the industry that social isn’t the biggest and only way to get conversions. It’s often a strategy that needs to be a part of something bigger and integrative such as email marketing, PPC and/or SEO. So, by ensuring that your goals are realistic against the wider tactics you are employing, you’ll be well ahead. With the emergence of user-generated content on all social networks, there’s huge opportunity to get your brand at the forefront of the very people you want to be exposed to your product or service. 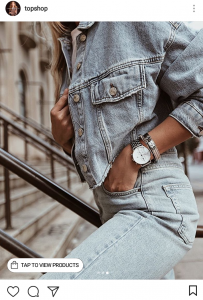 By sourcing this kind of organic content, current customers will feel in control and as if they are needed in the brand’s promotion process as they essentially become brand ambassadors. Brand trust is also heightened if a consumer has rated, tested and used the product before; potential consumers are more likely to trust feedback from current consumers similar in demographic than the brand themselves. With social networks (particularly Instagram & Facebook) constantly changing their algorithms user generated content is increasingly important. At the most basic level these algorithms essentially mean that the more users like or engage with a post, the more likely its reach will increase and the post appear on other news feeds. Therefore, the more individual users that share your content, or even make their own featuring your content or products, the higher the chance that you appear consistently across your audience. It’s really important to understand that using social media as a referral channel is not just an open platform for sales. Typically, users tend to go on social media in their down time, often to look at newsfeeds full of personal posts and have more intimate conversations with their connections & ‘friends’, particularly on ‘traditional’ social media channels such as Facebook and Twitter. 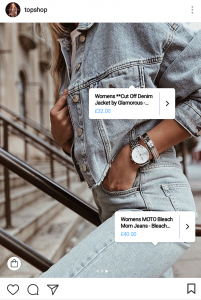 However, Instagram’s recent partnership with Shopify now allows business profiles to tag their products directly in the post, creating shoppable photos with direct links to the product page. As is highlighted in the picture (below), users simply tap to view the items & price in the picture, then tapping to go to the product listing on site, all whilst within the app. Using social media for your brand is an opportunity to build a network of customers or clients and engage with them on a more personal level. As is often said, social media is a channel for conversations and igniting a relationship, not just a sales pitch. There are a range of Twitter chats which often take place every week at a specified time. These chats are wide-ranged and include chats for almost every industry. There’s local business chats, handmade chats, possibly everything you can think of, there’s a Twitter chat for it. If there’s not, then create one! If it’s memorable enough, users will come back every week especially to get involved. There’s a number of tools that you can use to keep on top of Twitter chats, to analyse what’s working and what’s not, and to monitor the whole thing making use of hashtag streams and chat rooms. If you’re local to West Midlands and Warwickshire, download our free PDF Twitter chat calendar for local business chats. Facebook groups are a really good way of sharing knowledge between the industry, or sharing industry tips within a group of your audience. If you are engaging and create enough of an impact within the community, the traffic will follow as interest peaks across the group. How do social media platforms stack up? According to latest figures from Smart Insights, Instagram dominates, with Facebook having a considerable lead on Twitter and LinkedIn. That’s not to say that Facebook is the winner over Twitter and LinkedIn though. It absolutely depends on what your purpose is, as a brand or business. Is it purely awareness and user research or does it sit further down the sales funnel with the end goal to lead to a purchase? Facebook is infamous for it’s consistent algorithm changes in that it chooses what content to show on the basis of your interactions and engagements with other users across the network. It’s also the biggest platform for targeting potential customers on the basis of their likes, dislikes, location, age, gender, and other demographics. Instagram has increasingly been following in the footsteps of Facebook showing content on the basis of likes and engagement, with the platform deciding what users should see, however, recently an announcement has shown that there is going to be a ‘new posts’ tab to highlight the very latest uploads. This is good for brands, particularly those just starting out, as it has the opportunity to get the organic reach that is quite difficult to get without a ton of online fans. Pinterest is a platform that is often overlooked as a home interiors or household tips guide site often seen as a platform predominantly for women. This isn’t the case. Pinterest serves as a search engine, constantly changing and updating individual user feeds as per their latest pins and searches. The idea is that a user will ‘pin’ an item, post, picture, blog to a board – think digital mood board – and share it to their followers / community. You can utilise Twitter chats to engage with the community in industry chat, make connections, links and network your business within a specific community. If you’re a handcrafter, you could make use of the hashtag #handmadehour, for example. Twitter is also great for real time news and communication with your customers, boosting your brands reactive appearance, awareness and customer service. If you’ve read this far, and you’re still struggling to position your brand on social media, why not give us a call – 024 7630 3685? Have a look at what we’ve done for businesses already.